For about three years now, I've been somewhat meticulous about entering Coca-Cola bottle cap codes into the MyCokeRewards website. It's a fairly pointless endeavor, as, by my calculations, each point is worth only about three cents. Collecting and entering codes is like saving up pennies in a jar. Still, it's easy to do and the points do add up. Eventually. Recently, the brain trust over at MyCokeRewards revamped the website. In addition to the code entering, there is now a series of social challenges that you have to do in order to earn status. Greater status unlocks better rewards that you can use your points for. The social challenges entail linking your social networking accounts and posting content from MyCokeRewards to it, which essentially turns you into a shill for Coca-Cola. It's no longer enough to simply offer a loyalty program, My Coke Rewards now wants its customers to help them trend on social media. It's a poor business practice. First off, focusing so much on social media penetration is pointless, as Coca Cola isn't going to get much more brand awareness or attract many new customers via this method. Second, all of the shilling that My Coke Rewards is having their members do consists of re-posting content, thus relegating the tweets and statuses to little more than Internet background noise. Sure, MyCokeRewards may trend, but the content that pushed the trend will be meaningless. I can't help but think that My Coke Rewards should have thrown a bone to its loyal customer base and elevated everyone who was a member before the status system to the highest status. That hasn't happened, though, and it won't ever happen because it makes no sense from a corporate standpoint. There are millions of people who have a decent amount of points already sunk into the system and, in order to get a chance to redeem those points for some non-lame rewards, those customers are going to shoot for Gold status. So, they'll re-tweet and re-post content like some heroin addict making promises to his dealer in order to score a future hit. And the worst part about this whole ordeal is that the brain trust over at My Coke Rewards has disabled the ability to send in your codes via text. I hope that's only temporary, as that had been the only way to avoid dealing with the insanity of their website. Me? I'm out. What was once a recreational use of points has now become too impactful on my lifestyle. Forget the sunk cost. I'm cutting my losses. The only way to win this game is not to play. The level of respect I have for Electronic Arts has been declining for several years now. It took a huge tumble last year with the release of their lobotomized PC version of SimCity. Actually, I didn't think my opinion of Electronic Arts could get any worse. 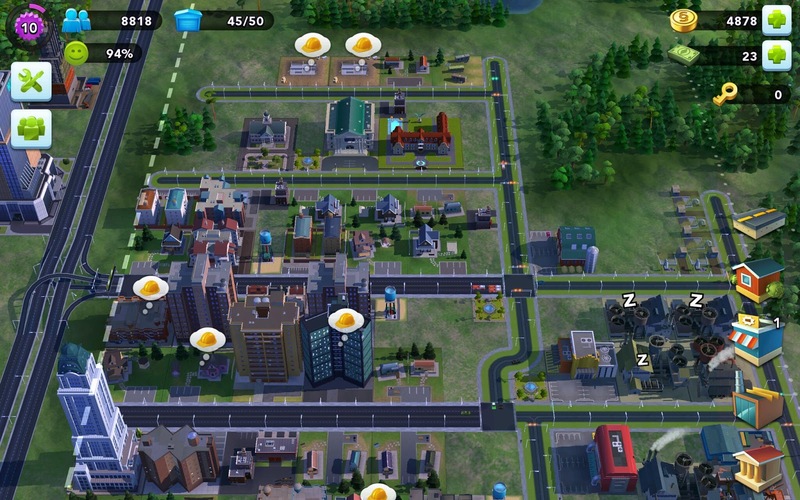 The release of SimCity BuildIt for Android and iOS has proven me wrong. The whole point of the SimCity franchise is that it's a City Simulator. And, yet, as I expected, there's not much simulation going on in SimCity BuildIt. It's more like a crafting game where you wait for various pieces of the neighborhood to spin up and fit in. It's basically an urbanized version of Hay Day. And, just like any freemium game, if you don't like waiting, you can pay real money to buy enough virtual currency to craft things instantly. Honestly, though SimCity BuildIt is somewhat fair with regards to the virtual currency. The craft timers are fairly reasonable and there aren’t any hard-lined pay wall barriers. Of course, coin shortage is a constant problem by design but BuildIt has a number of ways that you can easily earn more. There are plenty of opportunities to sell crafting materials to the AI. You can also sell materials to other players online. The most effective use is to use them to upgrade residences which will earn you a fair amount of coins instantly. In order to expand your land, you have to acquire certain special items, and the method for doing so seems to be too random, so it's incredibly frustrating. Still, SimCity BuildIt is a beautiful game to look at. You have full rotational control over the town and even the low-class buildings are gorgeously detailed. But, the graphics are just are superficial means to entire you into spending some bucks so you can build even prettier buildings. And the truly gorgeous structures have costs in amounts that one can never hope to achieve without paying for some virtual cash. All things considered, SimCity BuildIt isn't bad for a freemium game. But, if you're a fan of the old SimCity franchise, you're going to be frustrated and disappointed. I got a call recently from someone claiming to be from the National Claims Center hoping to find someone in need of federal disability benefits. First, I got a recording from (561) 231-1541 and it told me that I'd soon be getting a call from a live representative. The live rep called from (561) 231-5017 claiming to be from the National Claims Center and asked if I or anyone in my household needed help filing for disability benefits. Since this seemed like some boiler-room cold call scam, I put on my Clovis voice and messed with her a bit. You can hear her getting more and more frustrated as the call goes on. At one point, I reprimand her for interrupting me, after which she soon politely says he goodbye and signs off. I'm a Lego fanatic. In fact, one of the happiest days of my childhood was the Christmas when I received the Lego knight's castle. It's that passion for Lego that inspired me to bring the family to the LegoLand Discovery Center in Chicago over holiday break and it's that passion that I found lacking in every single employee in the place. Before I delve further into this review, let me offer a tip: Buy your tickets online. Trust me on this one. You'll be able to bypass the drones stuck waiting in line to buy their tickets at the counter. And, if you can arrange it, try to buy the "Arrive after 3pm" tickets, as they are cheaper and the LegoLand Discovery Center is open late enough that you won't miss anything by arrivng so late in the day. And don't bother purchasing the "Activity Pack". At $5 extra per person, it's not worth it. I offer these money making tips and tricks because LegoLand Discovery Center is just not worth paying full price or waiting in line for. The kids were all excited to go because, like me, they are Lego fanatics. In fact, they avoided buying anything at the traditional Lego store we encountered during a little side-trip because we were all sure that the gift shop at the LegoLand Discovery Center would have a better selection of items. It doesn't. Not by a long shot. It's basically the same type of store you'll find in any large mall. And, considering that you have pay so much to gain admission, you'd think that they'd offer a small discount on the items they sell. A better business model is definitely needed. By far, the most disappointing feature of the LegoLand Discovery Center is the employees. They have no passion for what they're doing and there were times when they were downright rude. I get it; an environment packed to the gills with tons of kids running around doesn't exactly inspire smiles. And it wouldn't be so bad if every single employee wasn't slow and plodding at their job. The play area is utter chaos, which is to be expected. Don't expect peaceful play in a place that admits children of all ages. And it was disappointing to see that no one was staffing the play areas. The Duplo area, intended for kids five and under, was overrun by older kids without any supervision. A staff member in the area just to maintain control or even to have a presence would go a long way. That being said, some of the Lego exhibits were impressive. Chicago in Lego looked incredible and was, for me, the highlight of the visit. The Dragon Ride was very cool, but the line to got on was longer than the actual ride lasted. And the ride didn't work properly as it had trouble tallying the shot scores of everyone in the gondola. There's also a 4D movie based on Lego Chima. Unfortunately, many of the 4D features were not working during our visit. So, my own recommendation is that you avoid LegoLand Discovery Center Chicago if you can at all help it. You don't get much bang for your buck. We decided to take take the kids to Medieval Times: Chicago Castle (actually in Schaumburg, IL) last Thursday night as part of our ongoing New Year's vacation. Back in my post-college days, I lived about ten minutes from that place and had always wanted to go, but never quite got around to it, basically because my friends and I often referred to it as "Ye Olde Tourist Trap"
The show is much like the Tournament of Kings at the Excalibur Hotel in Vegas. There's lots of fanfare, actors wearing costumes and talking in pseudo-old English accents, jousting, sword fights, utensil-less food, and wenches serving ale (at substantially marked up prices). Don't expected to get seated right away. Upon entering, you're led off to the great hall where you can buy various souvenir trinkets and where various upsell ceremonies take place. The Hall was packed to the gills with people making it hard to move around. I got so antsy over it that paying $10 for a beer in a souvenir mug actually seemed like a good idea. Anything to take the edge off. Once you get in, you're served a decent meal of texas toast, soup, chicken breast, grilled potato wedge, riblet and an apple turnover. Not bad. But, we didn't come for the food. We came for the show. As an actor myself, I appreciated how hard the actors at Medieval Times worked to battle each other and play to the crowd. The only bad thing I can say about the performance was that when any defeated jouster got knocked off their horse, the actors quite clearly jumped and it looked really fake. However, the rest of stage combat was really good. Whenever they clashed swords, sparks literally flew (something gimmicky about the swords, no doubt)! I also loved seeing the knights using flails and shields as weapons. Overall, I can say that we all had a great time and were glad that we went. Medieval Times is not particularly cheap, though. And there are a ton of upsell packages to wade through. Yes, it's gimmicky and yes it's touristy, but it's fun and it's something you should do at least once. Google photos made an auto-awesome movie of the video footage I shot at Medieval Times Chicago Castle. If you have a look at it, you can get a decent idea of what to expect. We took the family up to KeyLime Cove in Gurnee, IL. for New Year's Eve. We had signed up for the New Year's Eve party package which included a large room (2 adults, 4 kids) plus a dinner buffet and a breakfast buffet along with admission to the water park. Overall, everyone had a great time. There are two things I really want to highlight about KeyLime Cove. First off, the staff is incredibly friendly. We're talking Disneyland level of friendliness here. The lady next to me at the check-in counter was having a huge meltdown over her reservation having been cancelled and the agent serving her handled it with grace, poise and a concerned-yet-friendly smile. Second, I had expected to be overwhelmed by the smell of chlorine in the water park, but it's nonexistant. KeyLime Cove uses an ozone disinfection system to keep the water clean. As a tech/science geek, I found that to be pretty fascinating and it made me wish I could have taken the behind the scenes tour to learn more about it (offered on weekends only). There was a ton of stuff for the kids to do besides hang out in the water park. There were a number of activities going on over at the Leaping Lizard's center. The biggest non-aquatic hit was the arcade, though. The arcade issues cards which you swipe for play credits on each machine. It's pretty ingenius and you can end up spending way more money than you had intended to. Adults get special wrist bands which act as keys and are also used to charge things to the room such as alcohol and other items. Again, you'll spend way more money than you had intended if you're not careful. Every room in KeyLime Cove has a fridge, so you'd do well to bring your own soda, snacks and beer in order to minimize expenses. The dinner buffet included in the package we bought was nothing to write home about. It was decent, and the kids ate until they got their fill, but it wasn't something I'd have been happy to directly pay for. The breakfast buffet was really good, though. I think next year if/when we go, we'll either hit one of the actual restaurants inside KeyLime Cove or we'll order out. We will be going back at some point, however I don't think that KeyLimeCove is the sort of place where you'd spend more than a night or two. There just isn't enough to do there for any longer without getting bored. For a one night getaway, though, its fantastic!